2.A hot bath with these fizzies provides therapeutic value such as stress relief, relief of stiff joints and sore muscles, sinus and congestion relief, mood enhancement and is an excellent moisturizer for dry skin. 2.Whirl the water to distribute evenly through out the tub and enjoy a relaxing, fun bath. Our bath bombs are hot tub and whirlpool safe. Wrap in pantyhose if you want to use them in a jacuzzi. 3.Just for perspective, some of our customers use one bath bomb in a 72 gallon bath tub (which is a very big sized bath tub). Mixing and matching more than one of these bath bombs creates an amazing "new" smell experience altogether. 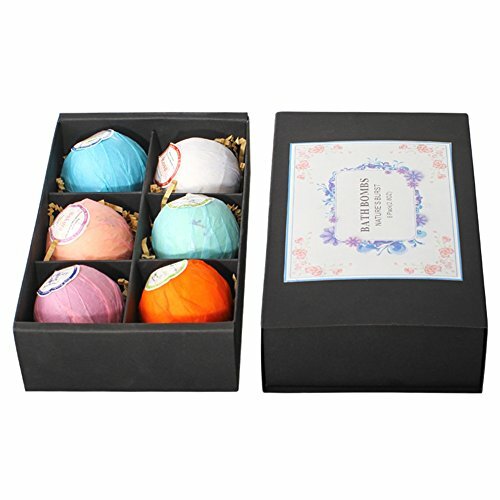 Our bath bombs provide a more enjoyable experience compared to bath beads, tub teas and can also be combined with bath bubbles. A good alternative for a bubble bath. A hot bath with these fizzies provides therapeutic value such as stress relief, relief of stiff joints and sore muscles, sinus and congestion relief, mood enhancement and is an excellent moisturizer for dry skin. Exfoliating all of those notorious rough horny, such as your elbows, knees and the heels of your feet. Get smooth skin by sloughing off dead skin on your legs, torso and arms. And of course your skin will be kissable-fresh thanks to the cleansing bathing salt. A superior moisturizer with vitamin A that improves a number of skin conditions such as itchy and dry skin, wrinkles and blemishes. Our bath bombs are free of artificial coloring and dyes and will not stain your skin nor your bath tub. If you have any questions about this product by Angmile, contact us by completing and submitting the form below. If you are looking for a specif part number, please include it with your message.